Let me tell you, I am quite the expert at setting both private and public goals, but more often than not, I fail (dismally too, eeeek) at achieving them. Especially with New Year’s resolutions. I even got to the point where I just stopped setting them, just so I wouldn’t disappoint myself. Instead, I started focusing more on finding ways to help me achieve my little goals in life. And I am glad to report that a resolution doesn’t have to be this daunting thing that requires drastic changes that overturn your life. 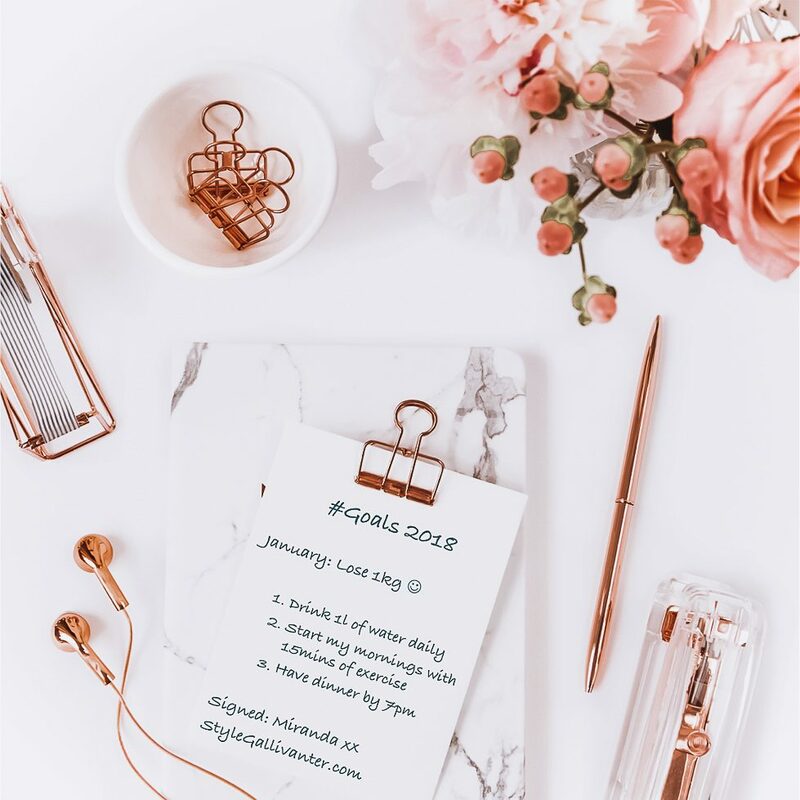 In fact, there are some pretty simple things you can start applying to your life right away that can set you up for the most successful year you’ve ever had! P.S. These will work with any goal you have, it doesn’t have to be just New Year’s resolutions, and I used weight loss as an example because most of us can relate to that. Without further ado, get your pretty pen and notebook and let’s dive into it. It’s never too late to start. I know! This article was posted on January 12th… alas! We have missed the January 1st cut off! Hahaha, that’s the first mistake we make. The truth is, the only cut off is in your head. So I am going to say this again, IT IS NEVER TOO LATE TO START making some beneficial changes in your life. Set monthly goals instead of 1 big, over-whelming, annual goal. Break down your big resolution into smaller, bite-sized goals. E.g. instead of saying I want to lose 12 kilos this year, break it down and say I will lose 1kg this month. This way, it becomes more achievable and not so intimidating. It is only a quarter of a kilo a week for crying out loud! Even the ‘couchiest’ of couch potatoes can achieve that! Write down 3 key things that will help you see that monthly goal through. For example, 1. I will drink at least 1 litre of water a day. 2. I will not eat after 7pm. I will finish eating by 7pm. 3. I will start my day with 30 minutes of exercise. Try to keep these positive, instead of saying, I will not be doing xyz, say I will do abc… get it? Make time for your small goals. This may mean waking up 30 minutes earlier, or even just re-allocating your time (taking time from your less beneficial habits e.g. Netflix, tv, endless wasted hours / minutes scrolling through social media). The truth is, if really you want it, YOU WILL MAKE TIME FOR IT. The key with breaking these into smaller goals is so they don’t impact your life too much, by requiring a drastic change. Hopefully the small changes, will eventually replace your bad habits with good ones (without you even realizing) 😉 Wouldn’t that be nice! Celebrate small wins. Write that down too. I will …………………………………………. after I lose 0.5 kg. P.S. Celebrate in a way that doesn’t undo all the good work you have been doing (i.e. if you have been eating healthy and working out, don’t reward yourself with an “all you can eat buffet” at that junk food restaurant! That just defeats the purpose). Rather, do something else that you enjoy (I certainly hope you have other passions besides food 😉 For example, you can buy yourself a nice journal or a planner to help you achieve even more goals for the year, you can go for a pedicure / that beautiful spa experience you have been dreaming about, you can even have a day in, and sleep / do absolutely nothing (yes people, the latter is a dream of many, especially those of us who have acquired some offspring of late). P.S. it doesn’t always have to be a monetary reward. Give yourself some grace to make mistakes. Don’t get down on yourself too much if you end up doing something that compromises / doesn’t align with your goal. Just get up, dust yourself, and get back on the wagon. These goals will become even more achievable if you give yourself one day off per week, or even the whole weekend off to take a break. That way, all the good habits you are starting to form won’t feel like chores, and thus eliminating the desire to ‘cheat’. (the pleasure I get from using words like ‘thus’ bahaha…). Yes, the last thing you need is to become too obsessive over these goals, because that will just lead you down Disappointment Avenue. And we don’t want to go back there again, right? Right. Have an accountability partner. This really makes a big difference. If you are anything like me, some days most days will not see you waking up feeling inspired to roar like the lioness / lion that you are. Most days you will just want to laze around, and revert to that fat domestic cat, unfortunately. As enjoyable as the latter is, having an accountability partner will help you re-focus on what’s important and light that fire under your toosh to get you up and going like a rocket. But you can totally do this alone too. It is that achievable. It’s never too late to win. 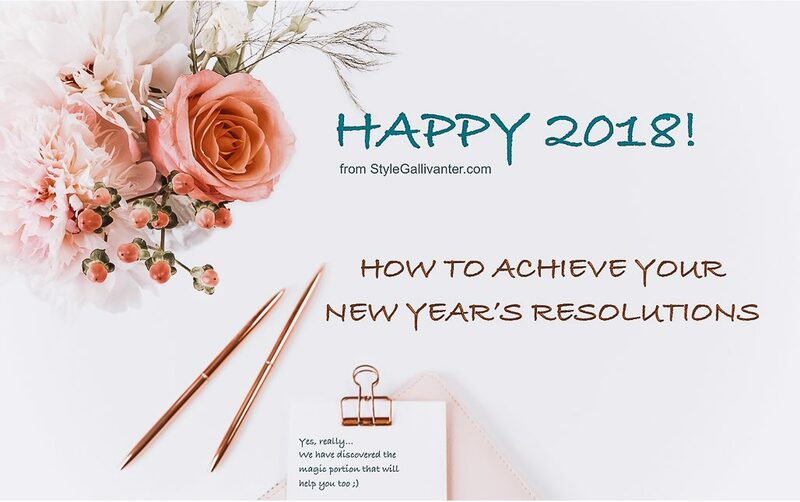 Sure, the whole point of this article is to make it as effortless as possible to achieve our resolutions for the year, but do keep the following in mind. The amount of effort you put in, will determine your end results. Anything worth having in life will always require some amount of work on your part. The most important thing you should get out of this exercise is to build new habits, e.g. hopefully I will keep drinking more water than I did last year, even after I reach my goal weight. Hopefully by achieving your bite-sized goals, you will start having more faith in your potential and start dreaming even bigger dreams, (as well as smashing them even faster than most believe possible)! And of coz, commit everything to God for more amazing results and watch how He blows you away with blessings galore! Here’s to a successful 2018! Cheers!! P.S. Do send me an email at StyleGallivanter@gmail.com if there’s any topic you would like to see covered on the blog (Style or Parenting). Have a wonderful and amazing 2018!